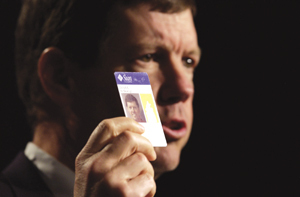 Sun Microsystems CEO Scott McNealy said he sees security solutions as a logical fit for his company's Java products. Every time a virus strikes, agencies call Sun looking for a more secure computing environment, he said. Intel's Rick Herrmann said the microprocessor giant would provide "building blocks" for next-generation wireless solutions and serve as a "trusted adviser" to agencies and integrators. For three days last month, tech companies took center stage at the 2004 FOSE trade show in Washington. They demonstrated products, discussed the government IT market and sought business partners for contract bids. And despite the fact that the overall 2005 federal IT budget, released in February, was relatively flat, experts said there are significant opportunities in the government market -- if companies know how to approach them. "There is an overall air of optimism," said Peggy Padalino, vice president of sales at Reston, Va.-based research firm Input Inc. "Government money hasn't really flowed until recently because agencies were working on policy and defining system architectures. Money is now starting to flow." Analysts and tech executives emphasized that this IT market is different from those of past years. The President's Management Agenda and other overarching initiatives require government to make better use of technology instead of simply buying more of it. Agencies are therefore less focused on buying the latest products and more focused on solutions that help them comply with mandates to operate efficiently. As a result, tech companies are changing the way they approach government buyers. Some companies are repackaging their products into government-tailored solutions bundles. Others are seizing on trends within government, such as network consolidation, to make a fresh case for their particular brands. Vendors also said they will use a more consultative approach to help them understand each customer's unique problems before trying to sell a product. And they will be looking to partner with integrators more than ever to help identify and resolve those problems. At FOSE, Siebel Systems Inc. of San Mateo, Calif., announced a radical repackaging of its customer relationship management products to address the specific needs of government. FOSE is produced by PostNewsweek Tech Media, publisher of Washington Technology. For example, while Siebel continues to sell software applications that run call centers, manage information and analyze data, it now offers them in six mix-and-match solution sets focused on bigger tasks, such as building a 311 citizen response center, managing immigration services and providing government agencies with a better understanding of taxpayers. The solutions sets are based on custom deployments of Siebel software, said Anthony Deighton, general manager of Siebel's employee relationship management group. For example, Siebel's 311 Citizen Response solution set grew out of New York City's 311 call center, which was built by Accenture Ltd. more than a year ago and continues to incorporate individual Siebel products. "If you just implement Siebel, that's not going to provide the bigger picture that agencies are trying to get at," said Amy Santenello, senior research analyst for Stamford, Conn.-based Meta Group. "Siebel and others recognize that they are part of a [larger] solution." The emphasis on solutions has several industry leaders touting technologies that you otherwise might not associate with their companies. Networking leader Cisco Systems Inc. is aggressively pushing IP telephony solutions to help agencies consolidate voice and data networks. Meanwhile, microprocessor giant Intel Corp. is touting "The Wireless City" as a way for local and regional governments to improve agency productivity and deliver better service. Cisco and Intel win by selling components -- networking hardware and chipsets, respectively -- of the overall solution. "Government is now Intel's No. 1 vertical," said Rick Herrmann, Intel's sector manager for worldwide government solutions. "We're working with software vendors and systems integrators on next-generation architectures that will help transform government operations." mann said Intel is looking to establish a wireless working group that would bring together government agencies and vendors to help spur wireless adoption. "We're in a unique position because we're not an end-user supplier, but we work with vendors, and we work with systems integrators, so we can play the role of trusted solutions adviser," Herrmann said. The fresh focus on solutions also lets companies better position their products in the government market, experts said. Sun Microsystems Inc. of Santa Clara, Calif., which has struggled to crack the government's preference for Intel-Microsoft office platforms, is seizing on network security as the solution area that may open the door further for its Java- and Solaris-based products. Scott McNealy, Sun's chief executive officer, said every time a new computer virus or worm attacks government networks, Sun gets calls from agencies looking for a more secure operating environment. McNealy said most agencies, particularly in the military, are now piloting Sun's Java System software, which includes the Java Desktop System, an open-source operating environment and application suite that competes with Microsoft Windows and Office. "If you look at the military command and control systems, they run on Sun because they have to be secure and robust," said Tom Kreidler, Sun Federal president. "Now, they're starting to realize the same features they need ... in a mission-critical application are as important in running something like a mail system." [IMGCAP(2)]At FOSE, Cupertino, Calif.-based Apple Computer Inc. was trying to reintroduce itself to a government market that it all but abandoned seven years ago. "Back then, we decided to focus on our consumer and creative professional business and de-emphasize our commercial and government enterprise business," said John Brandon, Apple's vice president of the Americas and Asia Pacific. Before the company could refocus on government markets, Brandon said, it needed a new, nonproprietary operating system. Mac OS X, which Apple built on a Unix foundation and launched in 1999 for server systems, was that operating system. Today, Apple is marketing its Xserve G5 server as an open, low-cost platform for a variety of government solutions, including high-performance computing. Virginia Tech built one of the world's fastest supercomputing clusters using Apple servers, and Brandon said the Naval Medical Research Center recently built an Apple-based cluster for researching biological defense. Now, Apple wants to build better relationships with systems integrators and government resellers, Brandon said. Vernon, Ill.-based reseller CDW Government Inc. recently added Apple products to its NASA Scientific and Engineering Workstation Procurement III contract. And Brandon said Chantilly, Va.-based GTSI Corp. is one of the company's strongest partners. Although this type of solutions marketing is not new in the commercial industry, analysts said technology companies are just beginning to think in terms of government-specific challenges, and their offerings are improving to reflect those challenges. "It's worth the investment for vendors to come up with products that recognize the business rules and workflow processes of government," said John Kost, managing vice president of worldwide public-sector research at Stamford, Conn.-based Gartner Inc. According to Meta Group's Santenello, the move to government solutions marketing is a long-term trend, fueled by more than technology initiatives. "We're facing a retirement boom within the federal government, and as a result [agencies] are looking for a way they can lean on the private sector to provide some solutions," Santenello said. "They don't have enough contract negotiators and project managers to manage all the various products that vendors can bring to the table. It's easier to have a larger systems integrator pull together the best-of-breed vendors underneath them than it is for the federal government to be managing all those contracts." Finding the right products will continue to be one way integrators can distinguish their proposals and win contracts. Kost said integrators should be looking for vendors that understand their role in the bigger solution picture. "To the extent that product companies build unique workflows and technologies that go with [government processes], it should make for an easier sale, and it requires a lot less creativity on the part of the government to figure it out," he said.